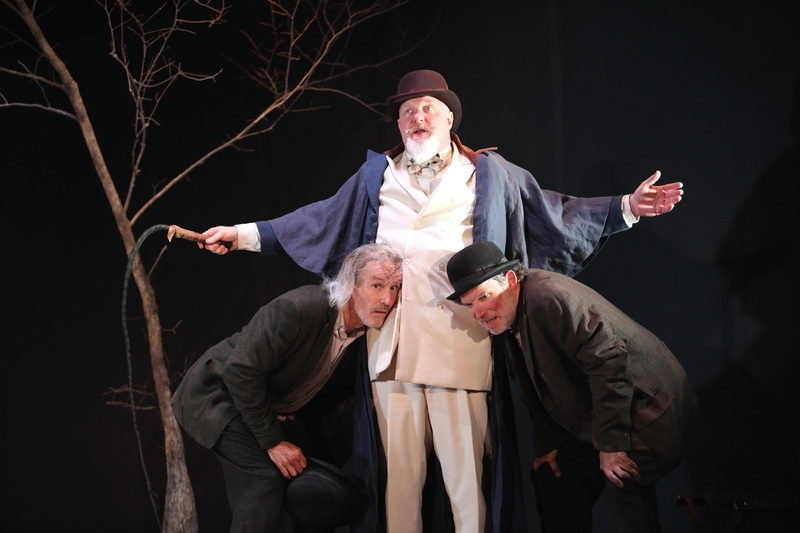 (Left to Right) Bruce Cromer as Estragon, Jim Hopkins as Pozzo and Nicholas Rose as Vladimir and in CSC’s 2015 production of Samuel Beckett’s “Waiting for Godot” directed by Brian Isaac Phillips, playing January 16- February 7, 2015. Performances are located at CSC’s Theatre, 719 Race Street in downtown Cincinnati. Tickets are $14-$35 and are available now online at cincyshakes.com or by calling the box office 513.381.2273. By Mikki Schaffner Photography. Have you ever gone to an art museum and looked at a painting that people have called “brilliant,” “significant,” and “genius” . . and felt a little left out? As if perhaps you aren’t as smart as you thought you were? WAITING FOR GODOT is the theatrical equivalent of abstract modern art for me. I feel compelled to remind you that the thoughts contained in this review are the opinion of one guy, a passionate theatre goer, who may not have a ton of formal education in theatre but definitely knows what he likes and doesn’t like. I make every attempt to be positive, affirming, and encouraging but I do want to maintain some sense of integrity and honesty. I never want to hurt anyone’s feelings. Finally, you should never take my singular opinion as a decision-maker for whether or not you attend a show. WAITING FOR GODOT is a classic. It’s been heralded as the “most significant play of the 20th century.” But I’m still waiting to understand why. I’d love to give you an analysis of the plot but there isn’t much of one. From what I understood, it’s about two guys waiting for someone named Godot and struggling with their existence in the most existential way. They encounter a man named Pozzo, who has a servant, who might actually be a pig. They also meet a boy who tells them Godot will come tomorrow instead of today and he does this everyday. I actually do get the symbolism more than I probably would have five years ago; personally I prefer a less abstract mechanism to make a point. This particular production feels uneven. I think Bruce Cromer is one of the most talented actors I’ve ever seen on stage. His physicality is his strongest attribute and utilizes that in his portrayal of “Estragon.” But it feels like too much the more this overly long play goes on, especially as he frequently bemoans (he literally moans) that they are still waiting for Godot. Cromer’s exuberant charisma is mismatched with Nick Roses’s quiet, internal strength. Rose (“Vladimir”), who I thought stole the show in THE BIRDS and is one of the most interesting actors I’ve ever seen, spends the first act wrestling with the schticky way Brian Isaac Phillips has directed the play. He loses; Rose should never be asked to “mug” for the audience. He is far better in Act Two, where the show feels more focused and better suited to Rose’s strengths. No one plays agonizing internal conflict better than Nick Rose. I also appreciate the breezy way he presents the dialogue; years of bringing Shakespeare to life and a passion to make it more accessible to the masses informs his choices. In the hands of a less capable actor, this material could easily get away from you but he has a conversational style that works well. Jim Hopkins’s (“Pozzo”) costume reminds me of Colonel Sanders and Foghorn Leghorn. Fortunately, Hopkins’ underrated talent allows him to grab a hold of the character and keep him grounded amidst the over-the-top slapstick in Act One. He’s a completely unlikable character but Hopkins makes him tolerable. He seems the most comfortable actor in this production. Brent Vimtrup has the unenviable task of portraying “Lucky.” Kudos to him for pulling off a very physically demanding role, which requires poor posture, uncomfortable positioning, and a wild and ambitious monologue. Young Jack Johnson (“Boy”) looks relaxed, confident, and plays his part well especially given that he is on stage with two of our cities most powerhouse performers. This is tough play to act; I respect anyone who gets on a stage and there are some moments of brilliance here. It’s unfortunately inconsistent. Andrew Hungerford’s set is sparse and uninteresting. His lighting is fine, though the final fadeout feels long and extends the show even more than necessary. I was hoping for something different with the technical elements. The costumes are unimpressive but serviceable. I just didn’t care for the production and on top of disliking the play itself makes for a difficult night of theatre. Luckily, the seats are comfortable, the people are friendly, and I always enjoy the atmosphere at Cincinnati Shakespeare Company. And they serve free food on opening night! WAITING FOR GODOT is a play that any theatre-lover should see; I am glad I saw it. Despite my criticism (Beckett takes aim at “critics” in the script by using it as the finale in an insult battle between the two leads), I would encourage you to attend the show and support CSC, which is committed to bringing the classics to life. These people work hard and are dedicated to their craft. The themes in this play are interesting and worth thinking about. The audience gave a standing ovation and there were lots of laughs throughout. For me, I’d rather experience existential nothingness through Seinfeld re-runs, Adam Sandler’s “50 First Dates,” and my favorite movie of all time, “Groundhog Day.” That’s more my style. WAITING FOR GODOT runs through February 7th at Cincinnati Shakespeare Company in downtown Cincinnati. Tickets and more information can be found here. Please check it out for yourself.